Recorded last year at Albarn’s West London studio 13, his forthcoming album, ‘Everyday Robots’, is produced by Richard Russell of XL, with whom Damon produced Bobby Womack’s ‘The Bravest Man In The Universe’ - and features guest appearances from Brian Eno and Natasha Khan (Bat For Lashes). Led by title track ‘Everyday Robots’, the 12 songs here invite the listener into Albarn’s world for a ‘one-to-one’ and are possibly the most soul-searching and autobiographical since his musical journey began: a career that started with Blur and spans Gorillaz, The Good, The Bad & The Queen, Mali Music, Monkey: Journey To The West, Dr Dee and Africa Express. The songs’ subject matter is more directly personal than before and is inspired by Albarn’s experiences from early childhood to now, including the trappings of our modern existence, computer games, mobile phones and nature versus technology. The lead, title track ‘Everyday Robots’ is accompanied by a video directed by artist and designer Aitor Throup. The film is a digital portrait of Albarn by Throup and uses CGI software and actual cranial scans and facial reconstruction techniques to explore and reveal the process of building a uniquely personal portrait of an artist and individual. Throup also creatively directed the visual concepts for the single and album artwork, as well as shooting Albarn for the album cover image. Damon Albarn will headline at Latitude Festival on Saturday 19 July 2014 with a band including guitarist Seye, drummer Pauli The PSM, bassist Jeff Wootton and Mike Smith on keyboards. 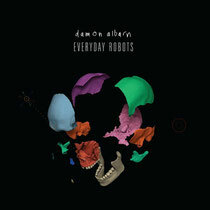 'Everyday Robots' will be available as a digital download, CD and 12” vinyl on 28 April.